Lexington, KY-August 19, 2014-On the heels of a week of championships in a sport that celebrates tradition, the USHJA Foundation is pleased to recognize and thank Dr. Kenneth and Selma Garber, the Hallman Family and Merrylegs South, the Oberkircher Family, and Jennifer and Roger Smith who recently became the first four founding members of the USHJA Foundation’s Legacy Circle. Legacy Circle founders and USHJA leadership at USHJA Wheeler Museum Reception (left to right): Bill Rube, Selma Garber, Dr. Kenneth Garber, Bridget Hallman, Penny Hallman and Bill Moroney. Legacy Circle founders not pictured include: the Oberkircher Family and Jennifer and Roger Smith. The USHJA Foundation’s Legacy Circle is a group of individuals dedicated to preserving the history and tradition of our sport through their financial contributions that benefit the USHJA Wheeler Museum. The initial five members of the Legacy Circle have the honored distinction of being known as the Founding Five of the Legacy Circle. The USHJA Wheeler Museum, established by a generous donation from the Wheeler Family, opened its first exhibit inside the USHJA Headquarters in 2010. Donations to the Legacy Circle will enable enhanced production and installation of rotating exhibits to educate and share with Kentucky Horse Park visitors the wonderful history of the hunter and jumper disciplines, and to bring awareness to our sport; will help us restore and digitize hours of rare and irreplaceable film footage so that it can be viewed and enjoyed for years to come; allow us to develop a viewing platform and library where these rare and historic video files can be readily accessed by interested viewers; and help us develop a dedicated website that offers not only online playback of archived film footage, but also digital museum exhibits. 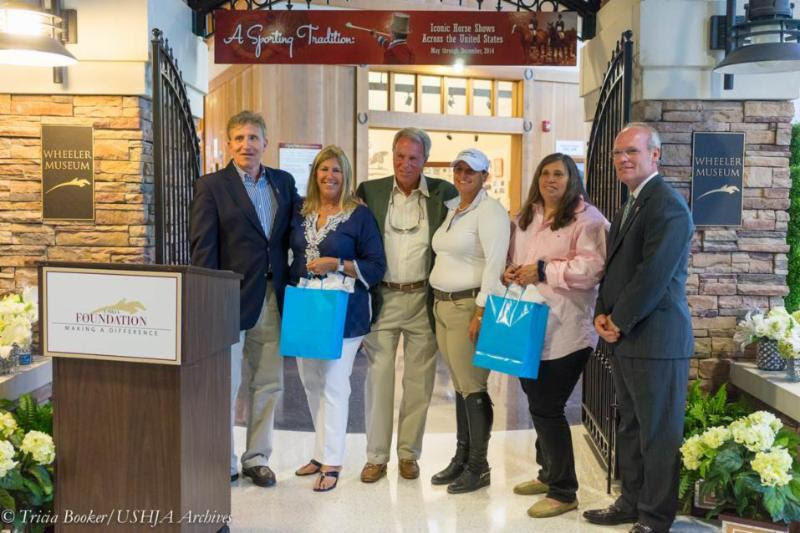 A special reception at the Wheeler Museum held on Friday, August 15, recognized the contributions of the Founding Five of the Legacy Circle, and a plaque honoring these individuals will remain in the USHJA Headquarters. For more information about the Legacy Circle or to make a donation that will benefit the USHJA Wheeler Museum, contact Megan Lacy, USHJA Foundation director, at[email protected] or (859) 225-6723. The USHJA Foundation is a 501(c)(3) nonprofit that provides charitable financial and educational assistance to members of the hunter/jumper equestrian community. Specifically, the Foundation, a supporting organization to the United States Hunter Jumper Association (USHJA), offers financial assistance to hunter/jumper equestrians in need, unique educational opportunities for hunter/jumper equestrians who face adversity, support for educational grants and scholarships for hunter/jumper equestrians, and preservation of our sport’s history through funding of the Wheeler Museum. The Foundation is funded through charitable contributions received primarily from individuals. For more information or to make a donation, visit www.ushjafoundation.org.